This is the replay of our recent chest X-ray webinar held January 27th 2016. The teacher of this webinar is award-winning author, Professor Julian Dobranowski MD from Ontario, Canada. It was a great success and people really loved it. So we thought, we’d provide you with an exclusive replay. 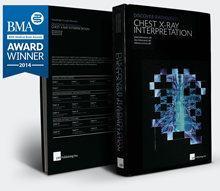 Also, absolutely make sure to check out Julian’s award-winning book entitled “Discover Radiology: Chest X-Ray Interpretation” on Amazon, which is currently available for $99 instead of the regular $159. That’s a 38% discount (available until Thursday March 17th ONLY). If you get the book before Thursday, you’ll be able to use your Amazon receipts as a $99 voucher on the yearly Medmastery membership (just email it to [email protected]). Get hands-on with real chest X-ray cases and practice using our diagnostic algorithm that makes interpreting chest X-rays a breeze. Learn the essential chest X-ray interpretation skills—how to identify pulmonary congestion, pneumonia, pleural effusion, cardiomyopathy, and more.